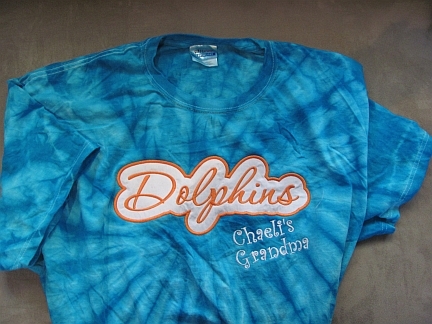 Here's a cool, yet retro way to show your Dolphin Team Spirit! T-shirt available in Adult sizes S-XL in teal or orange. Lettering will be teal on orange shirts;orange on teal shirts. Add Mom, Dad, Coach, Aunt, Sister, Grandma, or your favorite player's name (in white) at no extra charge.